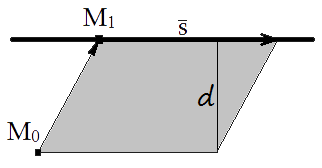 Distance from a point to a line - 3-Dimensional. Definition of distance from a point to a line in space. Online calculator. Distance from a point to a line - 3-Dimensional. Distance from a point to a line — is equal to length of the perpendicular distance from the point to the line. Having equated the areas it is simple to receive the formula of distance from a point to a line. M1(3; 1; -1) - coordinates of point on line. Answer: distance from point to line is equal to 5.